After the leak of Overwatch Origins Edition, even the release window of World of Warcraft: Legion has appeared. The following image clearly mentions that the game will be out by September 21, meaning that it should release during the Summer. The regular version is priced at $50, while the Digital Deluxe edition costs $70. Pre-purchasing gives you a Level 100 Boost and at least one week of early access to the new Demon Hunter class. 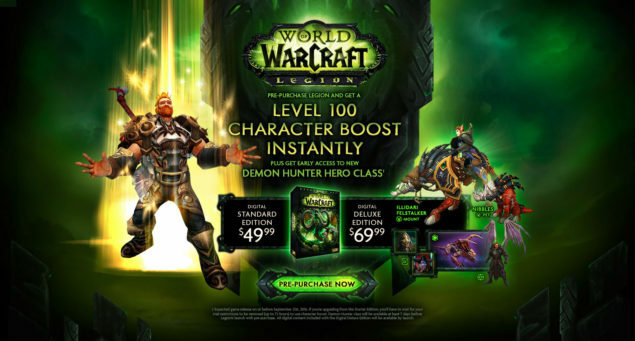 You will need a level 70 character to create a Demon Hunter and you can only have one Demon Hunter per realm. The expansion was announced during this year’s Gamescom convention. It will raise the level cap from 100 to 110, introduce a whole new region called Broken Isles and feature at least two raids and nine dungeons at launch; all classes will get access to artifact weapons via dedicated quest lines. With the return of Illidan Stormrage, Blizzard is also adding a new hero class, the Demon Hunter, which will start at level 98 and will be playable only by Night Elves (for the Alliance faction) and Blood Elves (for the Horde faction). Again, new details will probably be released at Blizzcon later today.